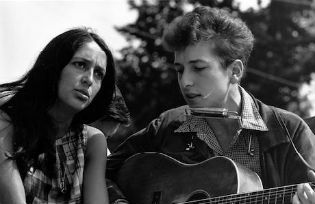 Joan Baez and Bob Dylan, Civil Rights March on Washington, D.C., 1963. Wikimedia / Rowland Scherman. Some rights reserved. The work of the great American musician, born 75 years ago, both expresses and transcends his own era. "Dylan's work, taken as a whole, is infused by deep time and the end times as well as his own, drenched in faith and fate as well as love and loss." Longevity is in these days. A young meteor of film or music racing through fast life to early death will always have romantic appeal. A mid-career artist’s grapple with setback or misfortune can have a nobility of its own. But a rock of ages pressing on against the fading of the light now seems to win readier and more heartfelt acclaim, including across generations. In part that reflects demographic, commercial and social trends. There are ever more older people, professional, influential and solvent, whose most enduring cultural loyalties were forged at a time, the 1960s-70s, when aesthetic tastes began to signify not just consumer preference but ethical commitment. Whether their ideals are upheld or have been allowed to rust, the opportunity for a late encounter with those who once inspired or embodied them has special appeal. The trends come together in the cultural marketplace. ‘Supply’ might be the group reunion, perhaps after a long-ago bitter breakup; the comeback tour, perhaps after illness or trauma; or the late novel, perhaps after a long-ago critical mauling. The promotion and curation of these events are themselves often a sophisticated fusion of art and commerce. ‘Demand’ might be symbolised by the rows of LPs or CDs, the creased volumes on stacked shelves in the homes of potential audience members, above all the tissues of personal memory and meaning threading through their lives. A family dimension, the chance to bond with children over old passions, and neophyte curiosity about the compelling era that went before, may also be in play. A vicarious reminder of buried feeling, or a measure of the distance between past and present, can also bring an extra frisson. The digital revolution adds further to longevity’s attraction. For this revolution makes the world and the past unprecedentedly instant and accessible, while providing only a simulacrum of their inner life (which only patient, extended engagement can begin to reveal). Digitisation’s mirage of nearness conceals this. The paradox of digitisation is that its impacts are both preservative and amnesiac. It conjures the promise of an authentic reality which it cannot fulfil. A longing for the human touch is the result. The living rock of ages seems more and more the place to look. Bob Dylan, who turns 75 on 24 May, seems to personify the case, yet the secret of his unique status – as I hope to show – is that he also transcends it. The escape begins with the singular twist he offers on artistic longevity, in that for a long time (and he has been making a living through his music for 55 years) he continues to perform, tour, record, play, write, and more according to an inner compulsion rather than any external need. Dylan’s continuing fecundity has become his most striking characteristic. He’s way beyond supply. Any new Dylan recording is big news for his devotees, but there has been much more in recent years. Dylan’s “never-ending tour” has been on the road since the late 1980s, in an endless loop across continents and cities: 85 shows in 2013, 92 in 2014, 87 in 2015. His paintings and sculptures have been exhibited in London and Copenhagen. His recent awards include France’s Legion d’honneur in November 2013, which followed the Presidential Medal of Freedom from Barack Obama in May 2012 (when the recipient’s impassive mien was capped by a pat on the commander-in-chief’s arm that was somehow classically Dylanesque, both reassuring and dismissive). The existence of Dylan’s own curated archive of 6,000 individual items, including detailed notebooks of compositions in flight, was revealed in March 2016. It has been sold to a group of institutions in Oklahoma, and will be based in Tulsa. And there are suggestions of a sequel to Chronicles, his picaresque yet lyrical memoir published in 2004, whose pages gleam with the translucent insight and deadpan observation also evident in the century of Theme Time Radio Hour music shows he hosted from 2006-09. At halfway through his current lifespan, Dylan had just produced three sublime albums (the underrated Planet Waves, Blood on the Tracks, and Desire) and gone on to the fantastic gospel-backed sound encapsulated by the Budokan concert of 1978. A serious embrace of faith, reverberating through his art, was just around the corner. The scale of his achievement was already huge, the loops and curves of his oeuvre enthralling. But he was just getting going, and only in time did it become clear that, like the blues singers he reveres, Robert Johnson, Ma Rainey, or Blind Willie McTell (honorific of one of his greatest songs), Dylan would be on the road, with his boots on, when the calling card came. There is, in short, so much in these years for both old listeners and new to discover. This echoes the point made in two predecessor articles, that there is more to hear from and learn about Dylan than any single person could possibly encompass (see “Bob Dylan: revolution in the head” [24 May 2006], and “Bob Dylan: revolution in the head, revisited” [24 May 2011]). Not so long ago, the situation was the opposite, as enthusiasts would attempt illictly to record concerts and scour the underground market for rare and precious bootlegs such as the holy grail: the “Royal Albert Hall 1966” when a dissentient fan, by shouting “Judas!”, provoked Dylan into what the discerning would regard as the peak live moment of the era’s cultural history, a majestic rendition of the incendiary anthem “Like a Rolling Stone”. The works accumulate, without eclipsing some of the finest earlier studies, many now neglected (among them Wilfrid Mellers’s A Darker Shade of Pale: a Backdrop to Bob Dylan, though Michael Gray’s Song and Dance Man, in its various iterations, is a perennial). The fact that so many focus on distinct aspects of Dylan’s work – Paul Williams on the performances, Christopher Ricks on the lyrics, Betsy Bowden on both, Toby Thompson on the Minnesotan, Sean Wilentz on the Americana – reflect its protean character. Yet Dylan continues to outstrip all, in that his work of the last two decades across the range, including the classic albums Time Out of Mind (1997), Love and Theft (2001), and Modern Times (2006) has evolved an extra sensibility of gravel and dread (as well as stepping aside from both, in the diverting Christmas in the Heart ). Dylan has never stopped, and his accumulating later oeuvre casts retrospective light on what went before. From the very early days, Dylan strikingly took death and existential loss for subjects, one of many inheritances from the Scots-English-Irish folk ballads and southern blues that informed his repertoire. In his later years this has acquired a new plangency as he goes with the flow of time while seeking to inhabit it, live it, be true to it. Allied to his craft, this constant search for imaginative and emotional truth whose form always changes, because life is change – is above all what makes Dylan a seminal artist. Enduring, another word for longevity, reframes the arc of a life and – especially when combined with that fecundity – challenges perceptions of it that can become frozen in time. So ingrained is Dylan’s story from New York onwards, so vivid the images, so potent the associations, so transfixing the products, it’s hard to grasp that the artistic explosion of 1960-66 also had a “before” and “after”. Dylan’s work, taken as a whole, is infused by deep time and the end times as well as his own, drenched in faith and fate as well as love and loss. Its wellspring is unreachable by any formula or agenda. It follows its own star, resists nostalgia, holds the door for imagination. It casts new spells, yet offers no false promise or even comfort. This is longevity as a slice of eternity, along a road still blessedly open.